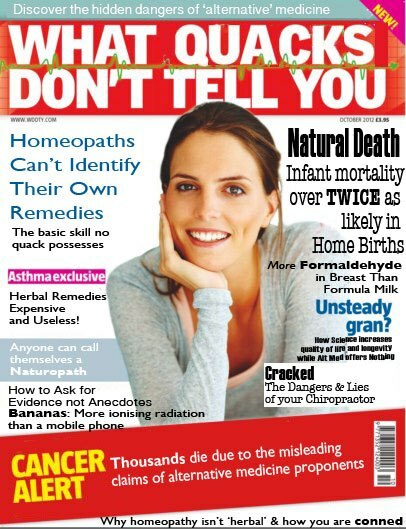 A copy of any magazine with the words psychic, crystal, natural health, what doctors don’t tell you, wellbeing, caduceus, mind, spirit, paradigm shift, or soul in the title. Simply roll both dice (you could choose only one of them if you want to have a chance of throwing a one – thanks Ashley) to get your first word from column 1 and write it down. Repeat with two more throws of the dice and the next two columns. You now have your QF phrase. This repeats for all the players until the round is complete. Now, pick up your magazine of choice and start flicking through it together, scoring 3 points if you find your entire QF phrase in an advert, 2 points if it has only 2 common words, or one if only a single. Scores are doubled if the QF phrase (or part thereof) is found in an actual article. The winner is the first to reach an agreed score, or the first to tear up the magazine and put it in the recycling. Have fun! In case of a tie, contact the nearest psychic, naturopath, reiki master, nutritionist, herbalist, homeopath, chiropractor or astrologer to sense the winner. Anyone wearing a PowerBalance or Shuzi band is automatically disqualified. Talking about bad astronomy everywhere it rears its ugly head.